theAd>>Gigantic Buffalo head! This is 100% real and hunted! $1200 obo. Buffalo head located Southwest for pickup! Mail me for more any other questions/details. Weird, on my screen it looks like it is located northeast. I'm not good with direction. Most of the time I like to use a dollar bill to provide scale to an object since people actually know how big that is. Or sometimes I use actual quantifiable measurements like feet and inches. 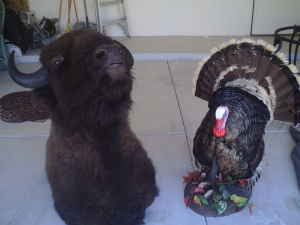 If you would please let me know how tall a fake, un-hunted turkey is I use that from now on. I think I am about 2 turkey 3 inches tall.